EDWARDSVILLE, IL (KTVI) – A 24-year-old Madison man faces up to eight years in prison after pleading guilty Friday to his involvement in an April 2015 fatal hit and run accident in Granite City. According to the Madison County State’s Attorney’s Office, Granite City police were called to an accident scene on Route 203 on April 19, 2015 just after 7:45 a.m. Authorities found the body of 25-year-old Mark Harris Jr. of St. Louis. It was determined Harris was the victim of a hit and run. Police used surveillance video from the area and identified the vehicle responsible, a 2004 silver Dodge Dakota. 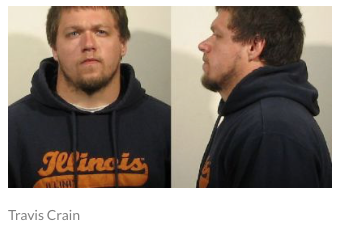 Investigators tracked down the owner of the vehicle, Travis Crain. Prosecutors allege Crain was traveling on Route 203 after 3 a.m. on Sunday when he struck Harris, who had been walking along the roadway. Crain was texting while driving. Crain pleaded guilty to one count of failure to report an accident involving personal injury or death. He’s been jailed on $750,000 bond since he was first charged.